Recent research in the area of suicidology has provided significant new insights in the epidemiological,psychopathological,and biological characteristics of suicidal behaviour. 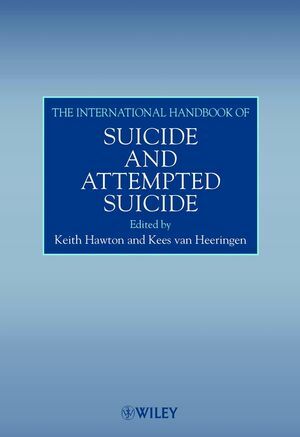 The International Handbook of Suicide and Attempted Suicide is the first book to bring together this expertise and translate it into practical guidelines for those responsible for policy issues and for those involved in the treatment and prevention of suicidal behaviour. Leading international authorities provide a truly comprehensive and research-based reference to understanding, treating, and preventing suicidal behaviour. They explore concepts and theories which best guide work within this field and detail key research which has supported conceptual developments, preventive interventions and clinical treatment. "No self-respecting worker in deliberate self-harm and suicide prevention, either clinical or research, can afford to be without access to this comprehensive handbook - possession and regular use, may well become a marker of serious involvement in the subject! ...This is the most comprehensive, up-to-date, informative and well-written source of information on sucide and suicidal behaviour...an invaluable work of reference which will be essential for clinicians and researchers for many years to come." Keith Hawton, University of Oxford, UK and Kees van Heeringe, University Hospital Gent, Belgium. Introduction (Keith Hawton and Kees van Heeringen). PART I: UNDERSTANDING SUICIDAL BEHAVIOUR. Suicide in the Western World (Christopher H. Cantor). Suicide in Asia and the Far East (Andrew T.A. Cheng and Chau-Shoun Lee). Attempted Suicide: Patterns and Trends (Ad J.F.M. Kerkhof). Biological Aspects of Suicidal Behaviour (Lil Traskman-Bendz and J. John Mann). The Psychology of Suicidal Behaviour (J. Mark G. Williams and Leslie R. Pollock). Ethology and Suicidal Behaviour (Robert D. Goldney). Psychiatric Aspects of Suicidal Behaviour: Depression (Jouko K. Lonnqvist). Psychiatric Aspects of Suicidal Behaviour: Schizophrenia (Marc De Hert and Jozef Peuskens). Psychiatric Aspects of Suicidal Behaviour: Substance Abuse (George E. Murphy). Psychiatric Aspects of Suicidal Behaviour: Personality Disorders (Marsha M. Linehan, Shireen L. Rizvi, Stacy Shaw Welch and Benjamin Page). Psychiatric Aspects of Suicidal Behaviour: Anxiety Disorders (Christer Allgulander). Sociology and Suicidal Behaviour (Unni Bille-Brahe). The Genetics of Suicidal Behaviour (Alec Roy, David Nielsen, Gunnar Rylander and Marco Sarchiapone). Pathways to Suicide: an Integrative Approach (Kees van Heeringen, Keith Hawton and J. Mark, G. Williams). PART II: SUICIDE AND ATTEMPTED SUICIDE IN SPECIFIC POPULATIONS AND CIRCUMSTANCES. Suicidal Behaviour in Children: an Emphasis on Developmental Influences (Cynthia R. Pfeffer). Adolescent Suicidal Behaviour: a General Population Perspective (Erik Jan de Wilde). Adolescent Suicidal Behaviour: Psychiatric Populations (Alan Apter and Ornit Freudenstein). Suicidal Behaviour among the Elderly (Daniel Harwood and Robin Jacoby). Sexuality, Reproductive Cycle and Suicidal Behaviour (Jose Catalan). Suicidal Behaviour and the Labour Market (Stephen Platt and Keith Hawton). Repetition of Suicidal Behaviour (Issac Sakinofsky). Physical Illness and Suicidal Behaviour (Elsebeth Nylev Stenager and Egon Stenager). Ethical and Legal Issues (Antoon Leenaars and Colleagues). Suicide and Violence (Mathew K. Nock and Peter M. Marzuk). Suicide among Psychiatric Inpatients (Manfred Wolfersdorf). The Impact of Suicide on Relatives and Friends (Sheila E. Clark and Robert D. Goldney). PART III: THE TREATMENT OF SUICIDAL BEHAVIOUR. Pharmacotherapy of Suicidal Ideation and Behaviour (Robbert J. Verkes and Philip J. Cowen). Psychotherapeutic Approaches to Suicidal Ideation and Behaviour (Heidi L. Heard). General Hospital Management of Suicide Attempters (Keith Hawton). Treatment Strategies for Adolescent Suicide Attempters (Philip Hazell). Treatment and Prevention of Suicidal Behaviour in the Elderly (Diego De Leo and Paolo Scocco). Multidisciplinary Approaches to the Management of Suicidal Behaviour (Kees van Heeringen). PART IV: THE PREVENTION OF SUICIDE AND ATTEMPTED SUICIDE. Prediction of Suicide and Attempted Suicide (Robert D. Goldney). General Population Strategies of Suicide Prevention (Rachel Jenkins and Bruce Singh). Prevention of Suicide in Psychiatric Patients (Louis Appleby). Approaches to Suicide Prevention in Asia and the Far East (R. Srinivasa Murthy). Suicide Prevention in Schools (David Shaffer and Madelyn Gould). Suicide Prevention and Primary Care (Konrad Michel). The Role of Mass Media in Suicide Prevention (Armin Schmidtke and Sylvia Schaller). Volunteers and Suicide Prevention (Vanda Scott and Simon Armson). Future Perspectives (Keith Hawton and Kees van Heeringen).